3.. 2.. 1.. Go! We’re open for fitness. Promotions: $135 for 1 month with no commitment and $155 unlimited for 12 months. We are happy to announce that… WE. ARE. OPEN! Yes, there is still some finishing touches being done but we, along we our first members, are here. Our first TWO on-ramps (1 month introductory programs) are also almost full and starting March 2. So, if you know someone who wants to give CrossFit a try – tag them! Opening Promo is $135 (12 one hour classes). We invite you to view our initial schedule link below and will be expanding this further over the spring and summer as we grow our membership and coaching staff. Last but not least… We’ve had a tremendous amount of support from the CrossFit community, it’s owners and members throughout this process. We are so grateful for all the guidance and positive vibes that have help make CrossFit CORYDON a reality. Rogue and Again Faster for outfitting us with some EXCELLENT equipment that we’ve thoroughly enjoyed testing out this last week; and as well our neighbors at Kristina’s on Corydon, Corydon Cycle and MAKE coffee for being so kind and putting up with the construction, WODs and providing some OUTSTANDING meals and much needed espresso! All the other boxes, owners, friends, family and supporters in this great city! 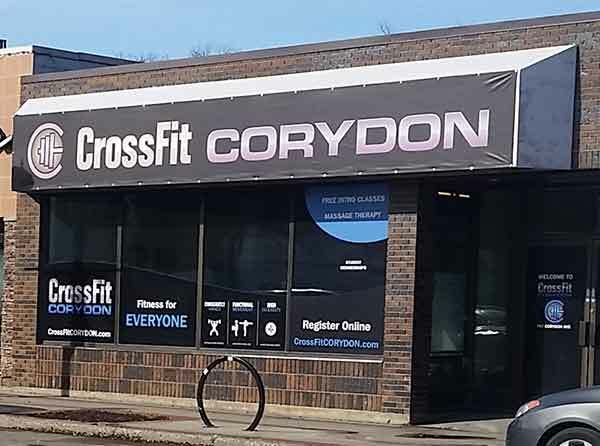 Without the help and support from those above, CrossFit CORYDON may not have existed. Home » 3.. 2.. 1.. Go! We’re open for fitness.